Social networking services have been popping up all over the place, with most of them presenting their own take on the social networking game. Of course, with so many services out there, features are bound to overlap one another. Have you ever played any of Zynga’s multiplayer enabled games and had trouble compelling your friends to play with you? Or maybe you’ve been playing Cityville and you want to increase the number of people you interact with? It was relatively difficult to find like-minded players before. 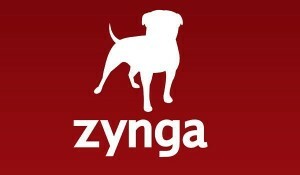 Apparently, Zynga also thought so. After nixing their free plans and embracing a pure premium model, Ning users are now able to choose the plan that is right for them, although Ning is giving users until the end of August to choose a plan or find a new home. 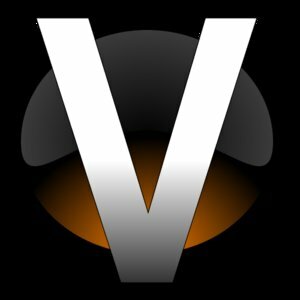 The three new plans â€“ Ning Mini, Ning Plus and Ning Pro â€“ are now live! 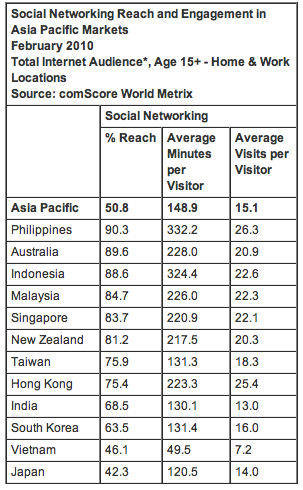 Comscore’s latest report on social networking activity in Asia-Pacific region shows that 50.8% of the total online population visited a social networking site in February 2010. This amounts to around 240.3 million visitors. As expected, Facebook ranked as the top social network across the region. The report also showed that Facebook was the top social network in 8 of the 12 countries in the region. Wretch.cc, Orkut, Cyworld and mixi.jp were the top social network in Taiwan, India, South Korea and Japan respectively. Will Hodgman, comScore executive vice president for Asia Pacific said that while social networking continues to be one of the most popular and fastest growing web activities in the world, its dynamics in the Asia-Pacific region exhibits significantly more individual market differentiation than in other global regions. â€œIn some markets, such as the Philippines, Australia and Indonesia, social networking is one of the most popular Web activities reaching nearly 90 percent of the entire Internet population, while other markets report less PC-based social networking penetration, which can often be attributed to the high propensity to engage in social networking via mobile devices in these markets,â€ says Mr. Hodgman. In terms of social networking penetration, the report found out that users in the Philippines have the highest level of Â engagement, with majority of the online population spending an average of 5.5 hours on social networks. 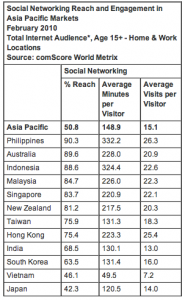 Users in Indonesia follow with 5.4 hours per visitor, Australia with 3.8 hours and Malaysia with 3.8 hours as well. The report did not include visits to social networking sites through mobile and PDA devices as well as from public computers such as internet cafes which is a big industry in most Asian countries.